Our curious kids like to think theyâ€™re â€œbuildersâ€�. They talk about fixing up houses and sometimes help with our renovations too (kinda ðŸ˜‰). One way weâ€™ve encouraged this interest in building/renovating/everything is with the toys and books we bring into our home. With Christmas just around the corner, I wanted to share a few of our favorites in case you too have curious kids who like to build. 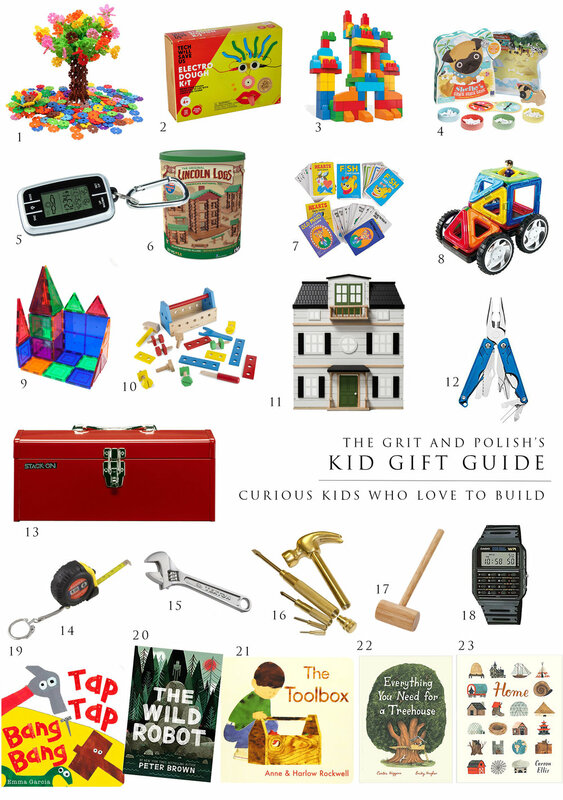 Our kiddos are aged 5, 3, and 1, so many of these gifts are targeted at younger kids, but honestly, many would work for older kids too (heck, even young-at-heart adults). We own all of these toys/books ourselves (or theyâ€™re on our Christmas list), so theyâ€™re Poshusta kid approved. And better yet, everything can still be ordered in time for Christmas! 1 // Brain Flakes - small disks for building any thing your imagination can think up. Weâ€™ve had these for a few months now and our older two love them. 2 // Electric Dough Kit - a great activity for a rainy day! This kit is easy and fun and an awesome introduction to electricity (a necessary skill for future DIYers ðŸ˜‰). Youâ€™ll have to make your own playdoh (instructions are included) so plan ahead. Canâ€™t recommend this one enough! 3 // Mega Blocks - these are really similar to Legos, but bigger and easier for small hands to build with. We spend a couple of afternoons a week building towers with these and itâ€™s just as much fun for me as it is for the kids. 4 // Shelbys Snack Shack - a learn-to-count game that our kids really enjoy. Personally I prefer to play cards or matching games with our kids but Iâ€™m often out ruled. They LOVE this game! 5 // Mini Mobile Weather Station - Santa is bringing this weather station for our 5-year-old and weâ€™re all excited to track the weather. We see this gift as something that will encourage curiosity and independence in our kiddos, which is something weâ€™re always striving for. 6 // Lincoln Logs - a childhood classic, these are always fun! 7 // Card Games - a great set of introductory card games to play with your curious kid. These are the kind of games that Iâ€™m reaching for in the evening just as often as our kids are. 8 and 9 // Magnetic Tiles - These come out almost every day at our Farmhouse. Theyâ€™re awesome to build with and pack up nicely in a bag when itâ€™s time to clean up. Our 3-year old is getting this set with wheels this year too. 10 // Wood toolbox - this is a great introduction to building. Weâ€™ve owned this wood building set for 5 years now and itâ€™s been fun for every kid. 11 // Dollhouse - Iâ€™ve been tempted to buy this dollhouse for awhile now. I love that itâ€™s not heavily gendered and would look beautiful in any home. This dollhouse (or one like it) will find itâ€™s way into our Farmhouse soon! 12 // Kids Leatherman - our 5-year-old got one of these for his birthday last year and itâ€™s great! The knife is removable, so a safe option for little kids who arenâ€™t quite ready for that responsibility. I canâ€™t tell you how proud our 5-year-old is every time heâ€™s able to do something with his leatherman! 13 // Steel Toolbox - all of our kids have toolboxes, which we like to fill up with tools at holidays. You can find great vintage versions on Etsy too, although be careful to check shipping times. This is a fun gift that you can add to over the years and a great way to make kids feel more involved in home improvement projects. Iâ€™ve included a few of our favorite tools below, but you could fill it with any safe tools you can think of (or already have). 14 // Small Tape Measure - these are amazingly popular around our house. Weâ€™ve had a few versions now and the kids love them! Bonus: thereâ€™s always a tape measure around when you need it! 15 // Wrench - this is an adjustable wrench, which means it will keep kids entertained for a long time, and bonus: it contains no pointy parts! 16 and 17 // Hammer + Screwdriver - This hammer has lots of screwdrivers nesting inside it. Kids can use the hammer as a tool or play with putting it back together. If your little one isnâ€™t ready for pointy screwdrivers or hammers, I recommend this wood mallet. 18 // Calculator Watch - I love this watch (math nerds are my jam ðŸ˜‰). It works great for all ages - my dad used to have one and my brothers wore them high school - but itâ€™s especially popular with our 5-year old, who now wears his to Kindergarten. 19 // Tap Tap Bang Bang - A great introduction to tools. This board book is for little kids and has always been a favorite at our house. 20 // The Wild Robot - I read this book with our 5-year-old over the summer and it had us both eager for bedtime. Itâ€™s about a robot in the wild and is pure perfection. This would be a great one for older kids that are reading on their own, too! 21 // The Toolbox - all 3 of our kids have read this book with us. Itâ€™s another great introduction to tools for little kids. 22 // Everything You need for a Treehouse - This is on our kidsâ€™ Christmas list. Not only is it beautifully illustrated, but itâ€™s on point for us since Garrettâ€™s eager to build a treehouse at our Farmhouse this Spring. 23 // Home - a picture book of all kinds of homes. Weâ€™ve read this one at my sisterâ€™s house and it comes highly reviewed! One note about this list: Iâ€™ve tried to included well-built, long-lasting toys that you can keep indefinitely or pass along as a hand-me-down when/if youâ€™re kids outgrow them. We like to avoid plastic as much as possible, but have found it hard with toys. So we make sure anything we do buy (plastic or not) will keep our kidâ€™s interest and last for a long time. Happy (last-minute) Christmas shopping to you!